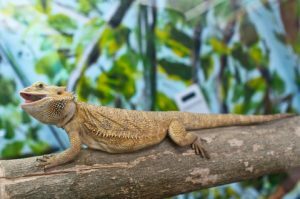 Providing adequate full spectrum lighting for a bearded dragon is very crucial for its overall health and well-being, especially a captive-raised bearded dragon. In the wild, a bearded dragon will receive natural UVA and UVB rays while basking out in the desert sun. When kept indoors, those rays must be replicated using special full spectrum UV florescent bulbs. 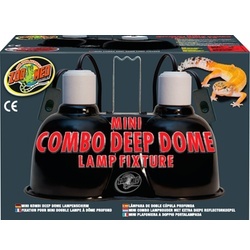 Full spectrum lighting for reptiles offer high UV outputs similar to those found in desert environments. Here are some guidelines for choosing the correct full spectrum lighting for a bearded dragon. 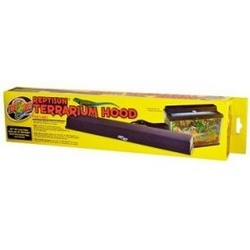 The UV florescent bulb should stretch the length of the bearded dragon’s enclosure and be seated in a hood or ballast that is especially designed for reptiles. Most UV fluorescent bulbs come in sizes ranging from 18″ to 48″ so choose one that best fits the length of the terrarium. The lighting should cover at least 80% of the length of the terrarium. You can use multiple bulbs if needed for a long terrarium. This ensures that the bearded dragon receives beneficial UV rays no matter where it is in the enclosure. It is important that your pet receives at least 10 to 12 hours of exposure to the lighting each day. Failure to provide UVA and UVB rays can lead to many health issues including mental problems, loss of appetite, and Metabolic Bone Disease. Do not use ordinary household fluorescent bulbs. Household fluorescent bulbs provide good visible light, but do not produce enough UV radiation to sustain a bearded dragon. We recommend using fluorescent bulbs with high UV radiation output for a bearded dragon. 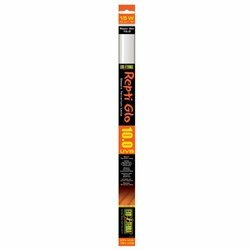 Zoo Med ReptiSun 10.0 UVB Bulb and the Exo Terra Repti Glo 10.0 UVB bulb are both recommended choices for supplying the proper amount of UVB rays for your bearded dragon. It is also recommended to use caution using the new compact florescent bulbs because there have been cases where the bulbs have burned the eyes of some bearded dragons. Until the compact fluorescent bulbs have had further testing, we recommend using linear fluorescent bulbs. A very popular method of supplying the proper amount of UV radiation and heat is by using a Mercury Vapor bulb. These bulbs are a bit more expensive, but work well and last longer than florescent tubes. 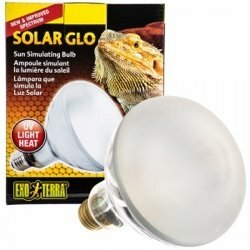 The Zoo Med PowerSun UV Mercury Vapor bulb is an excellent choice that will keep your bearded dragon healthy and happy. As mentioned earlier, it is important to supply full spectrum lighting across the enclosure as much as possible. It is also important to place the bulb as close as possible to the bearded dragon so that it can take full advantage of the radiation emitted from the bulb. Keeping the bulb twelve inches or less from the reptile is ideal for good radiation exposure. Keeping the bulb farther away lessens the effects of the bulb and drastically reduces its power. Always follow the manufacturer’s recommendations for proper radiation exposure. Never place the bulb above a glass top because the glass will filter out the UVB and UVA rays rendering it virtually useless. Use a screen top for best results. 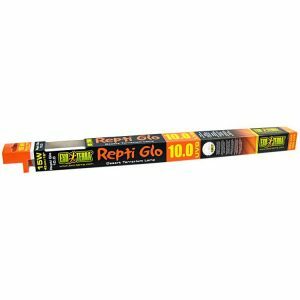 We recommend to always house fluorescent bulbs in a fixture specifically designed for use with reptile lighting. One of the best fixture options is the Exo Terra Dual Linear Canopy Top. The Dual Linear Canopy Top can house two separate bulbs – a high output UV bulb and a visible light bulb. Using both bulbs in this fixture provides good UV exposure and enhanced lighting for good color-rendering. The highly polished aluminum reflector increases light, UVA, and UVB output by up to 100%. As you can see, choosing the correct full spectrum lighting for a bearded dragon is extremely important for its health and well-being. 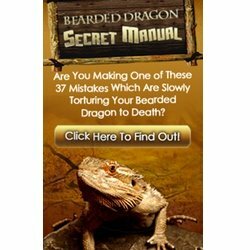 Providing full spectrum lighting for a bearded dragon isn’t difficult if you follow this guide. Always follow the manufacturer’s recommendations for bulb placement and use. Very good post. I think a alot of people underestimate the proper lighting requirments of diurnal lizards far too often. of excitement, pleasure and joy of living, an exclusivity.